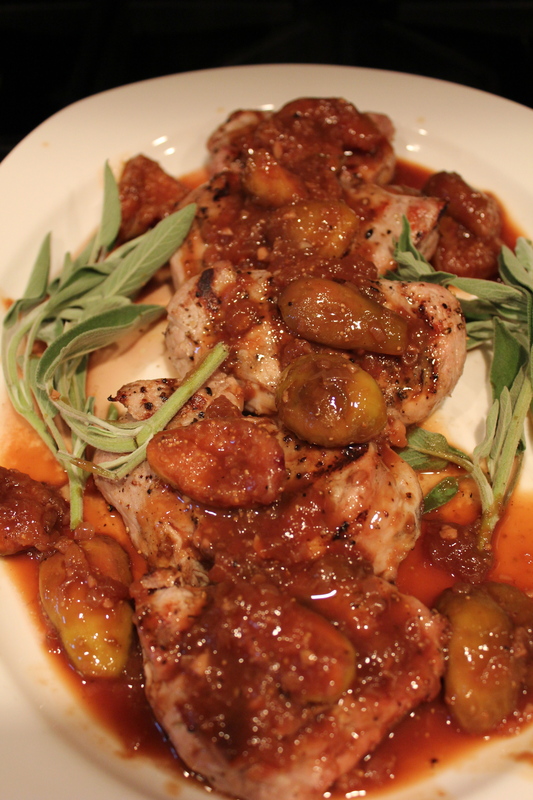 Grilled peaches, grilled plums, grilled watermelon, grilled pineapple – all pretty common. Grilled bananas??? Why not! 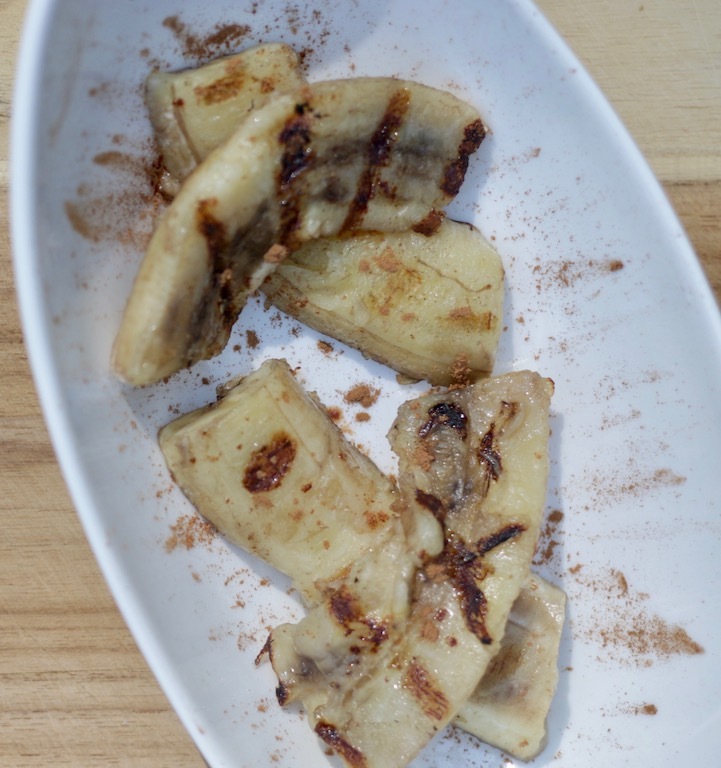 Grilled bananas are delicious and great for breakfast on cereal, granola, pancakes or waffles. They also make a great dessert over ice cream! Check out my ice cream cookbook here! The key to success is to use underripe bananas. 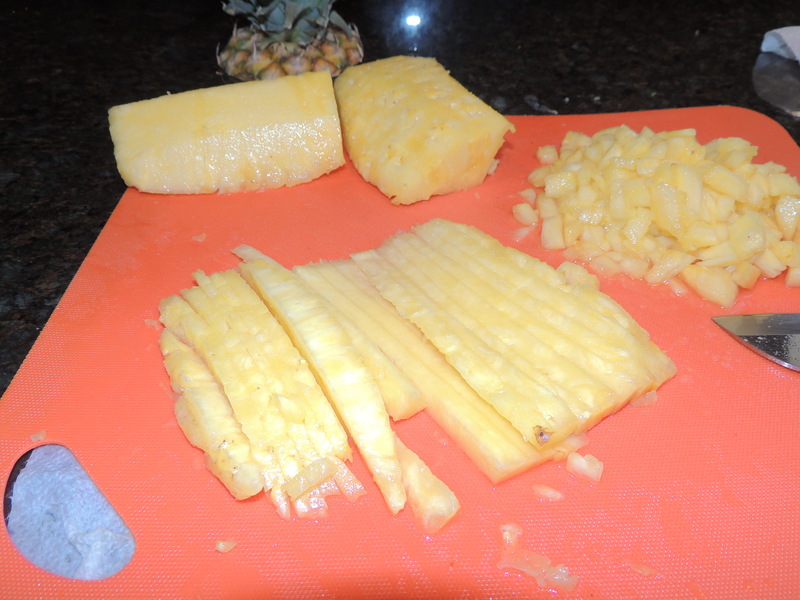 A ripe banana is soft, softens more on the grill and gets mushy. Taste a sliver of the banana. Want it sweeter? 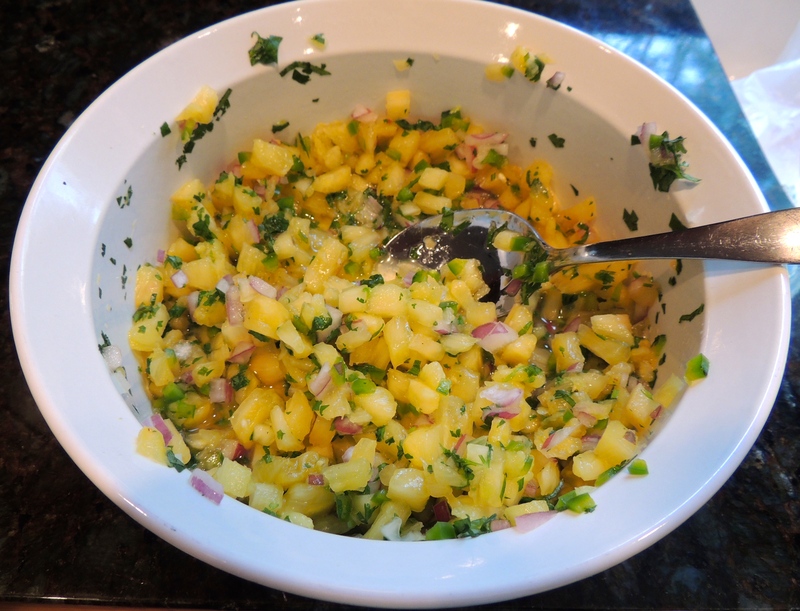 Brush with a little honey or agave before grilling. There is no “recipe” for this. Use as many bananas as you like, brush lightly with a sweetener, if needed. 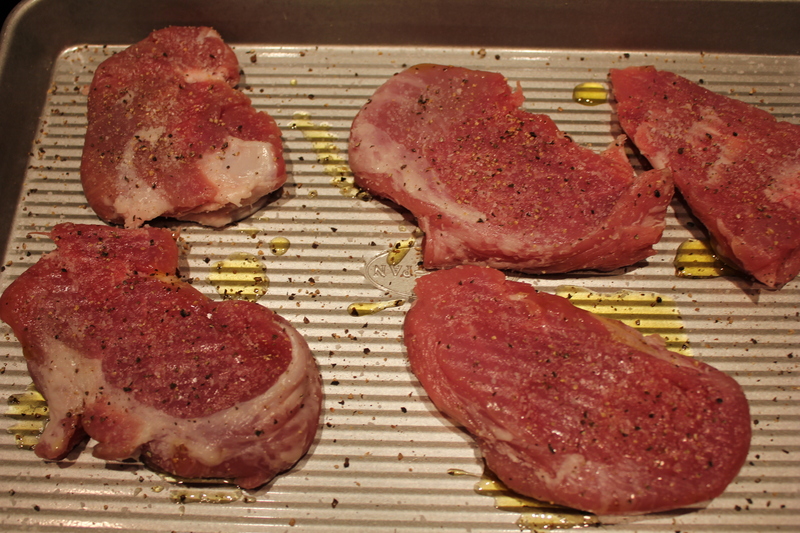 Place on a hot grill and cook a minute, turn and cook a minute, turn and cook a minute, turn and cook a minute. Sprinkle with cinnamon and serve. Sprinkle immediately with cinnamon to release the essential oils and aroma. Watch the Grilled Bananas Video Here. 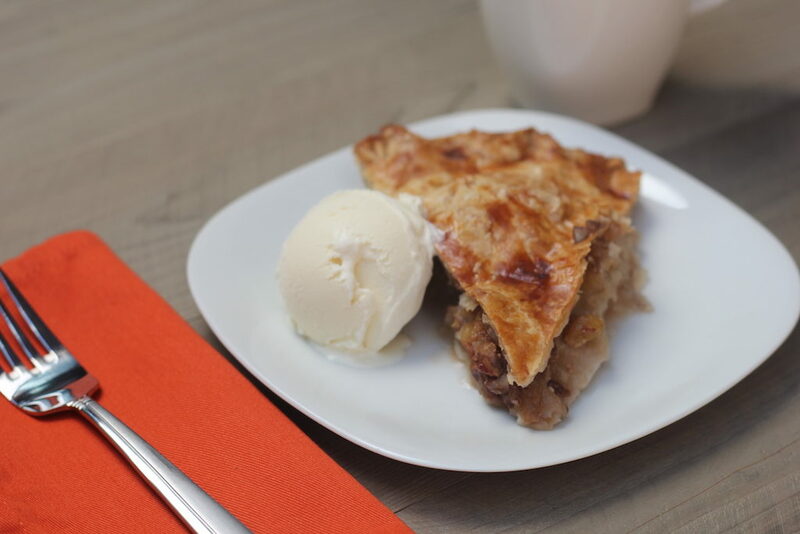 Apple pie is a family favorite. Apple orchards are plentiful in Rochester, NY, my hometown and we always have a nice assortment of varieties on hand and drink lots of fresh-pressed apple cider. Deep Dish Apple Pie is just an excuse to use more apples! 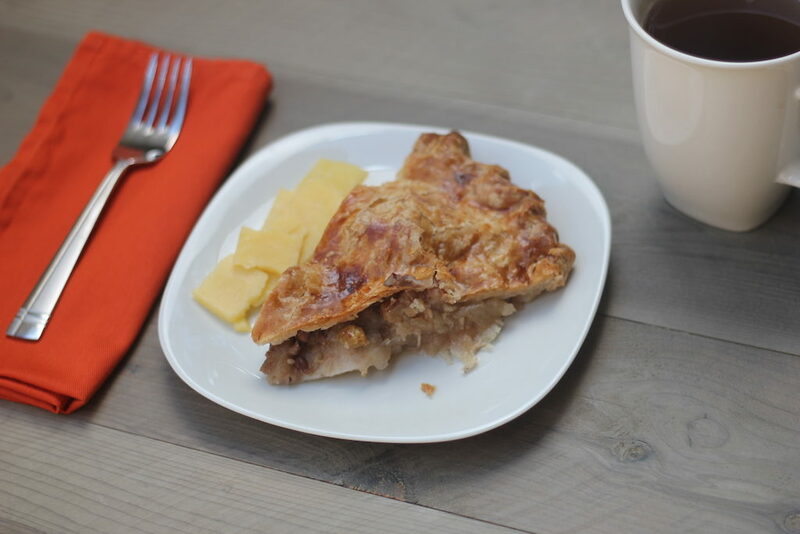 I think most people are familiar with apple pie ala mode, but in our family, the pie was always served with sliced extra-sharp Cheddar cheese on the side. The cider mills we bought our apples and cider at also sold cheese. After all, cheese and apples are a natural pairing! 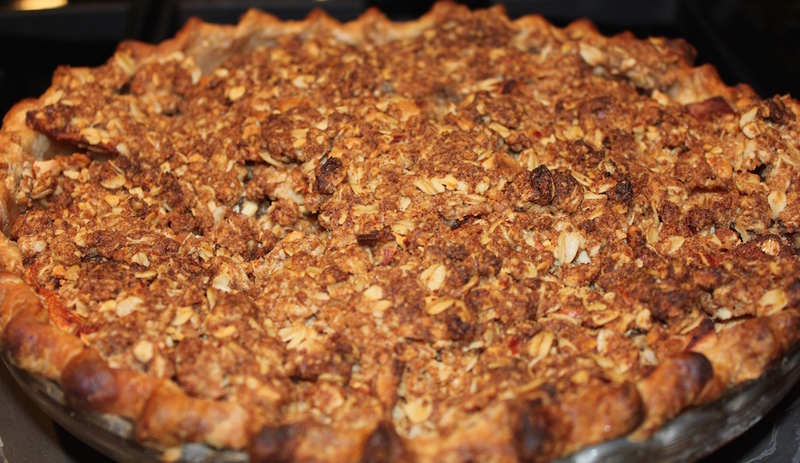 For a more interesting and complex pie, use at least three types of apples, such as Granny Smith, McIntosh and Rome. 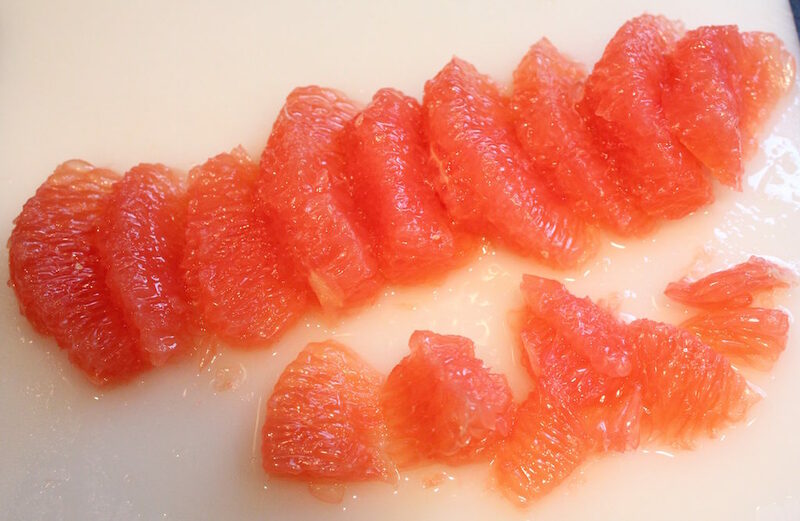 The sweet, tart and soft, firm textures blend nicely. 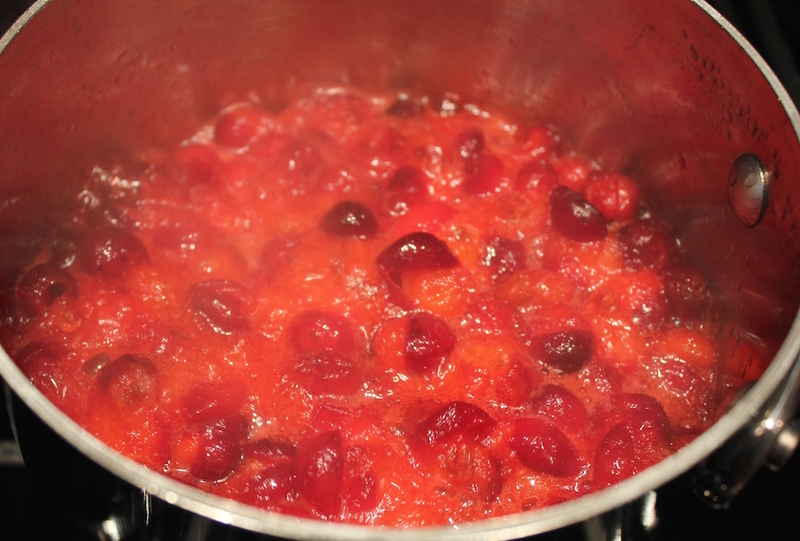 Nuts, raisins and/or dried cranberries are a nice way to mix it up a little, the nuts provide texture and the dried fruit soaks up the apple juices. 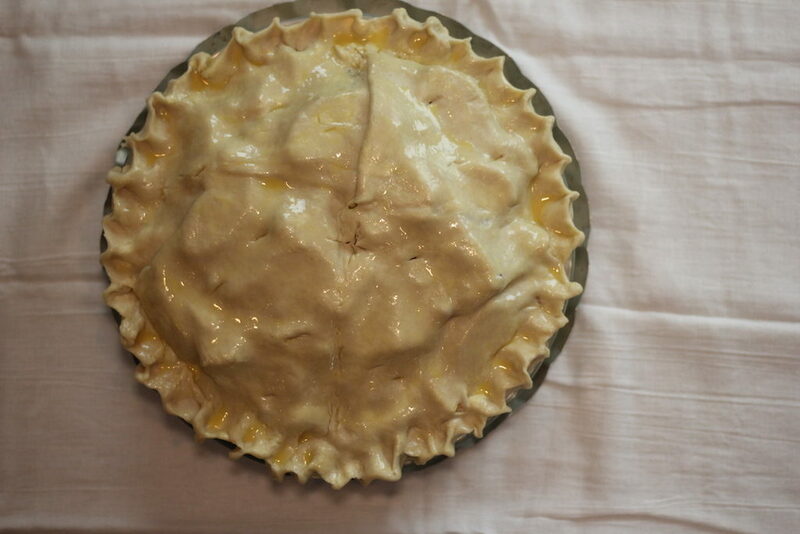 Don’t forget to pierce the top of the pie dough several times. 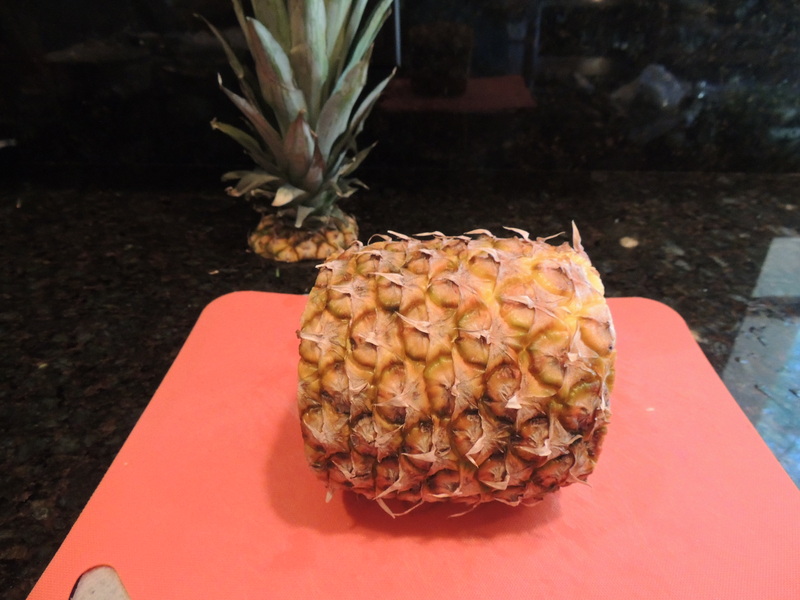 This allows the steam to escape and keeps your crust intact. The egg wash creates a shiny, golden brown crust – don’t skip it. I’ve never seen a pie recipe butters the pie pan. I think the high fat content of the pie dough makes everyone think it won’t stick, but it does, and the bottom crust doesn’t easily release. 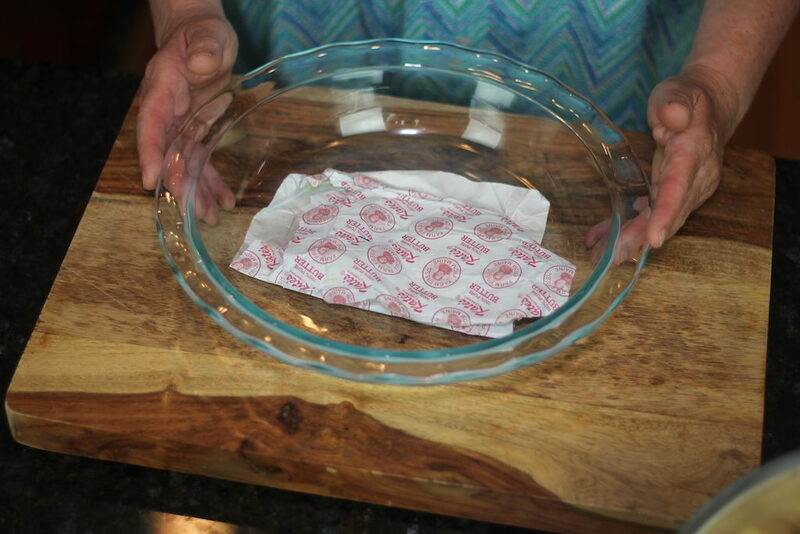 So save those butter wrappers from the pastry dough and use them to butter the pie pan. You can thank me later! 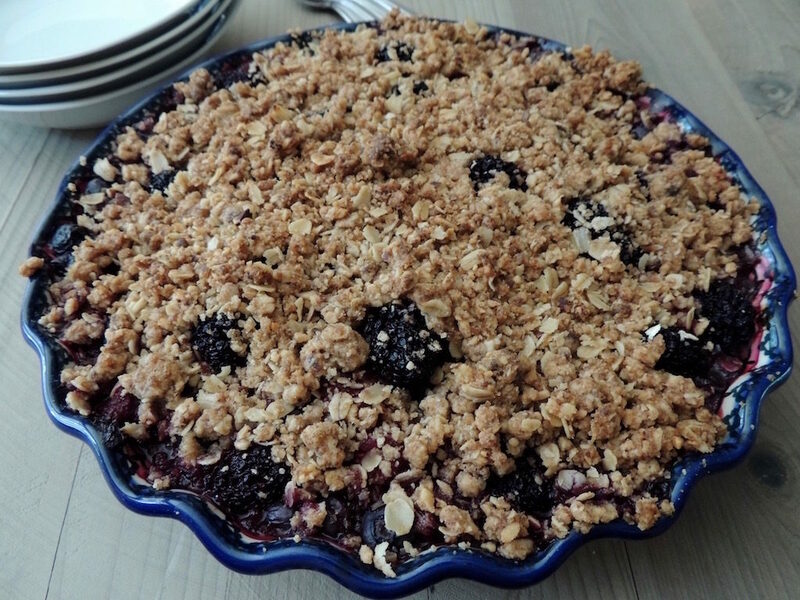 This recipe calls for a double crust, add 2 tablespoons sugar to the recipe for a sweet crust. 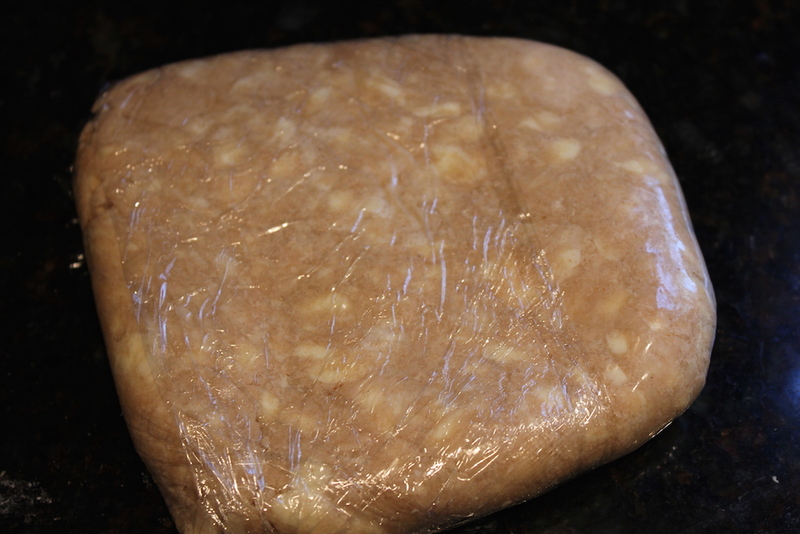 The pie can be frozen uncooked and baked from the frozen state. Wrap tightly and store for only a month. Bake at 450 for 20 minutes, then lower the heat to 350 and bake another hour or until the apples are tender when pierced with a knife. 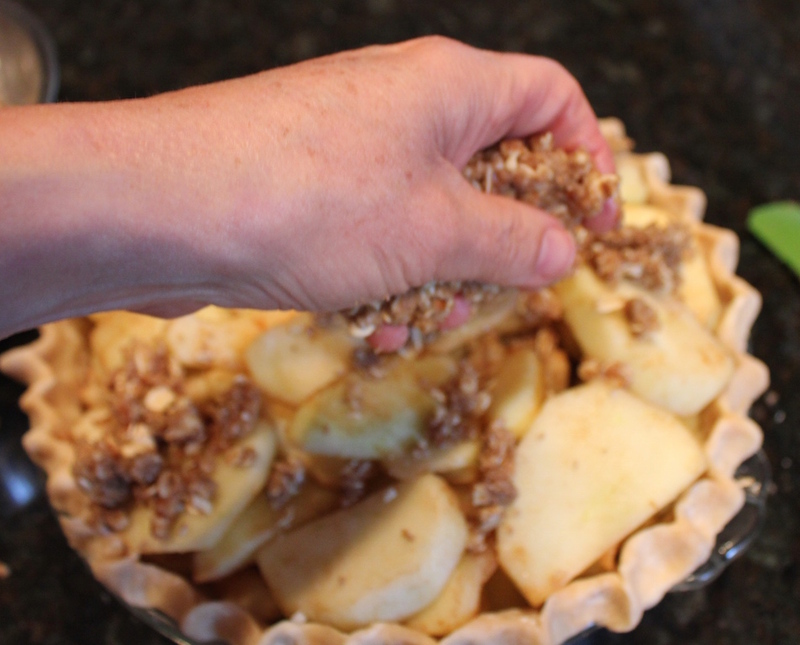 For a more interesting and complex pie, use at least three types of apples, such as Granny Smith, McIntosh and Rome. 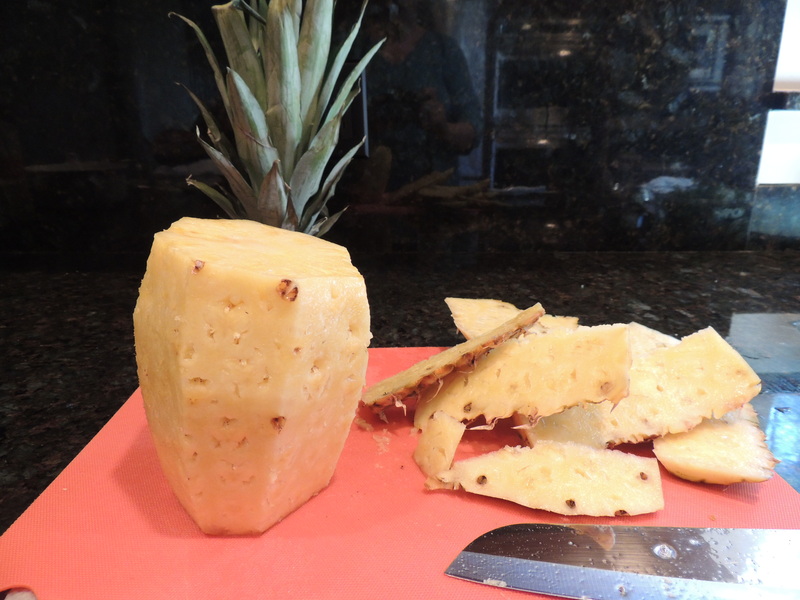 The sweet, tart and soft, firm textures blend nicely. 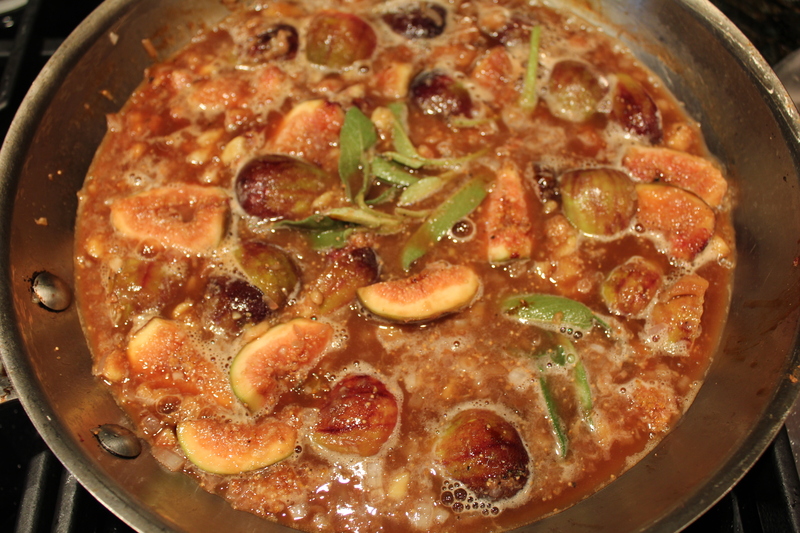 Nuts, raisins and/or dried cranberries are a nice way to mix it up a little, the nuts provide texture and the dried fruit soaks up the apple juices. 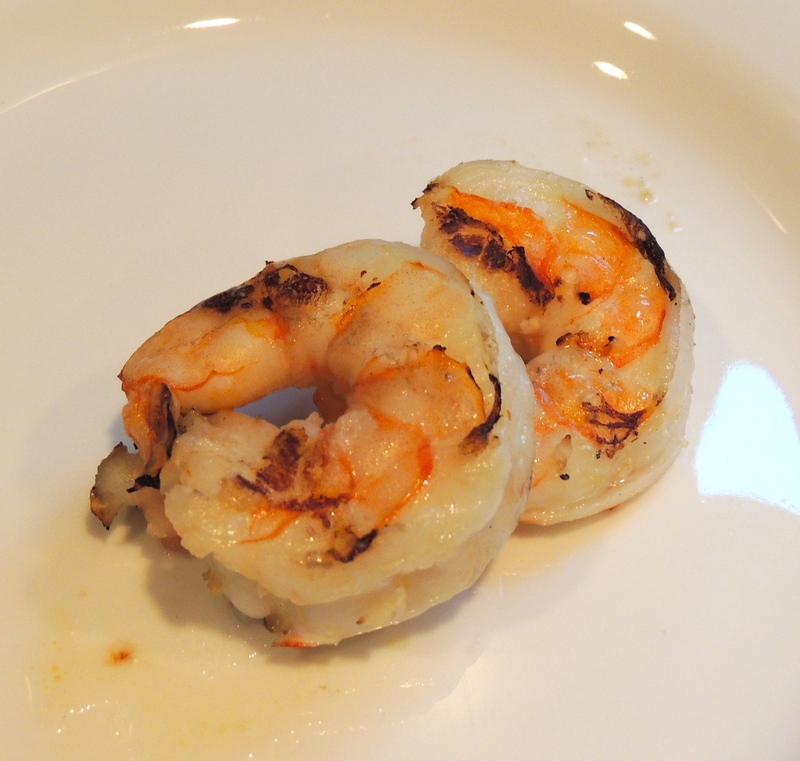 Serve with extra-sharp Cheddar cheese on the side. 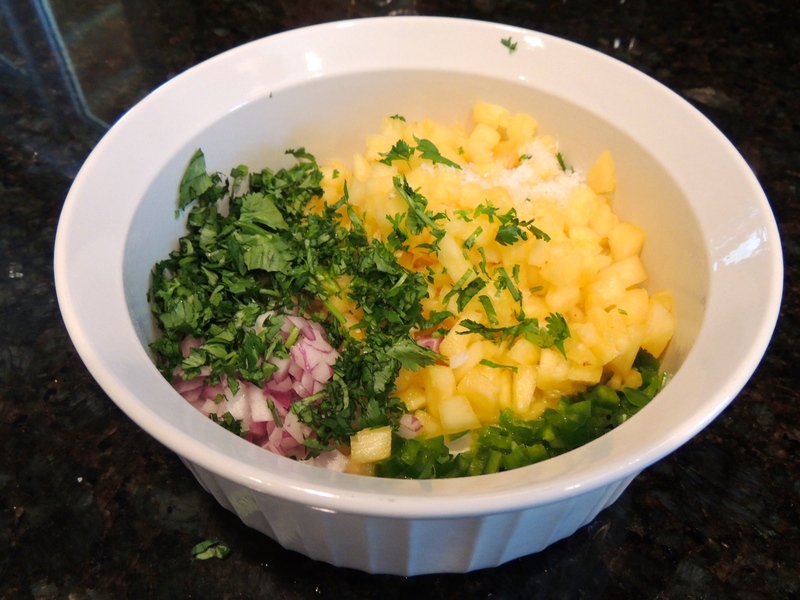 Roll out the two pie crusts and line the bottom of a dish dish pie dish with one. 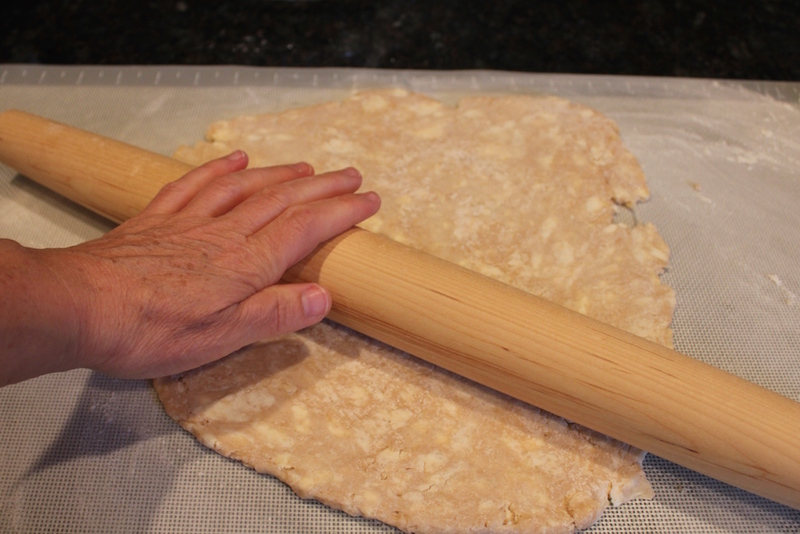 See post on how to roll out a pie crust. 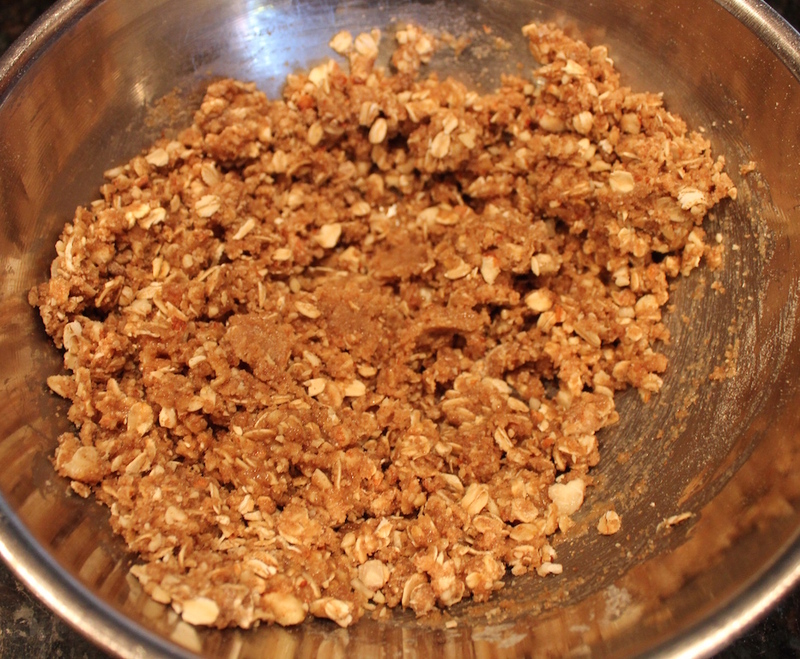 Combine the apple slices, lemon zest, lemon juice, chopped walnuts, raisins, sugar, all-purpose flour, cinnamon and salt in a large mixing bowl. 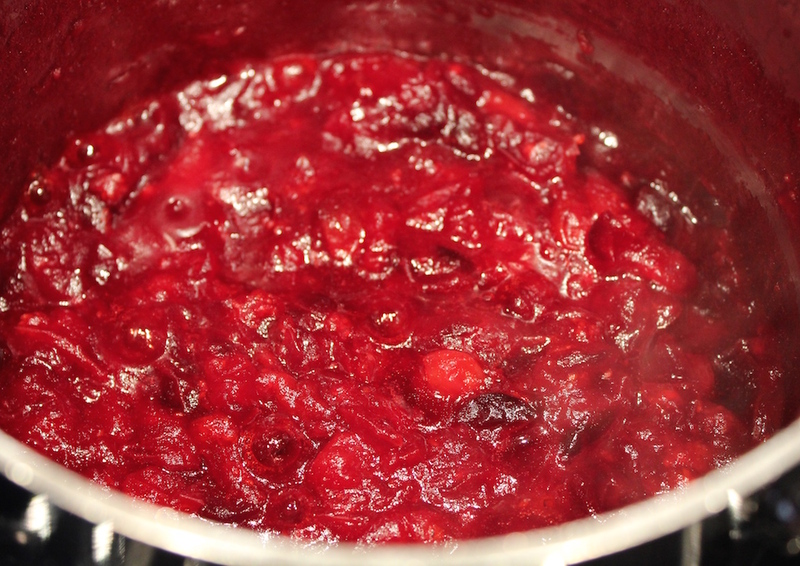 Pour mixture into a prepared bottom crust in a 10-inch deep dish pie pan and tuck in the fruit to fit tightly. 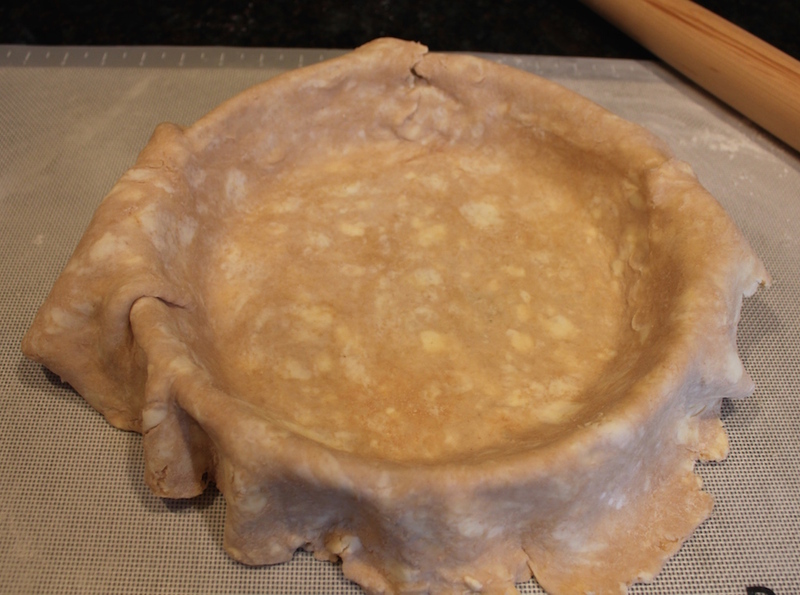 Cover with the top crust, crimp, and cut steam wholes. 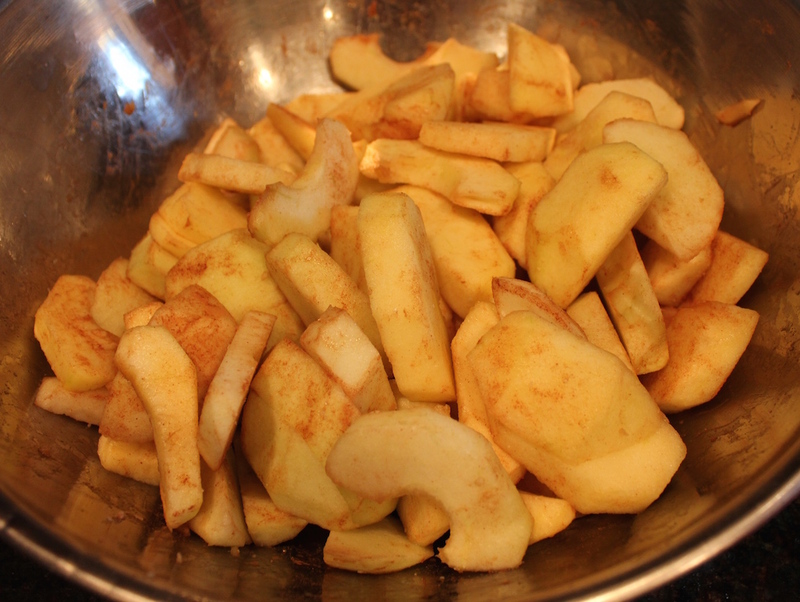 Bake in preheated oven for one hour, or until apples are soft when pierced with a knife. 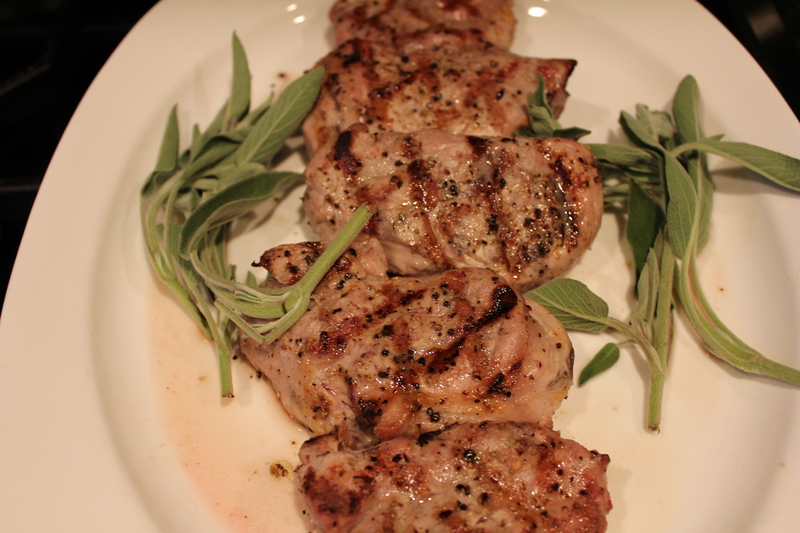 Remove to a baker’s rack and cool. 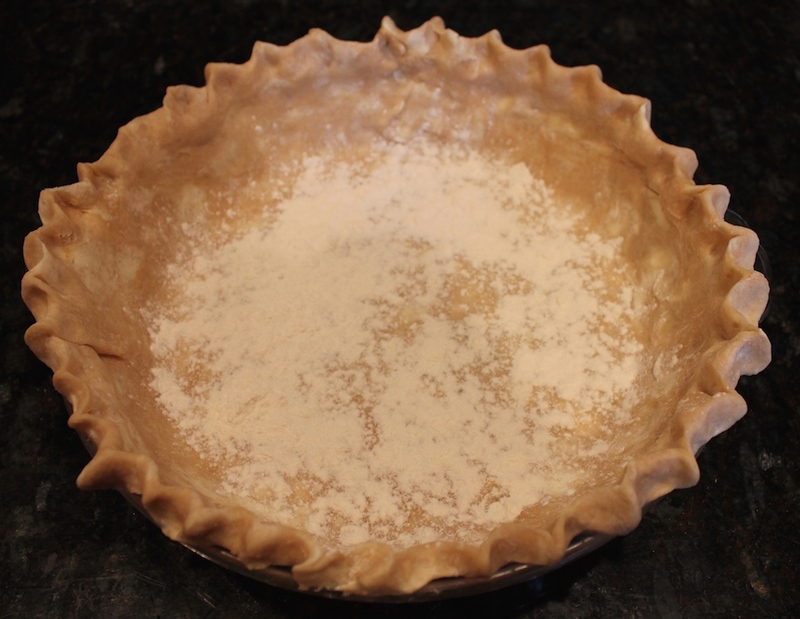 The pie can be frozen uncooked and baked from the frozen state. 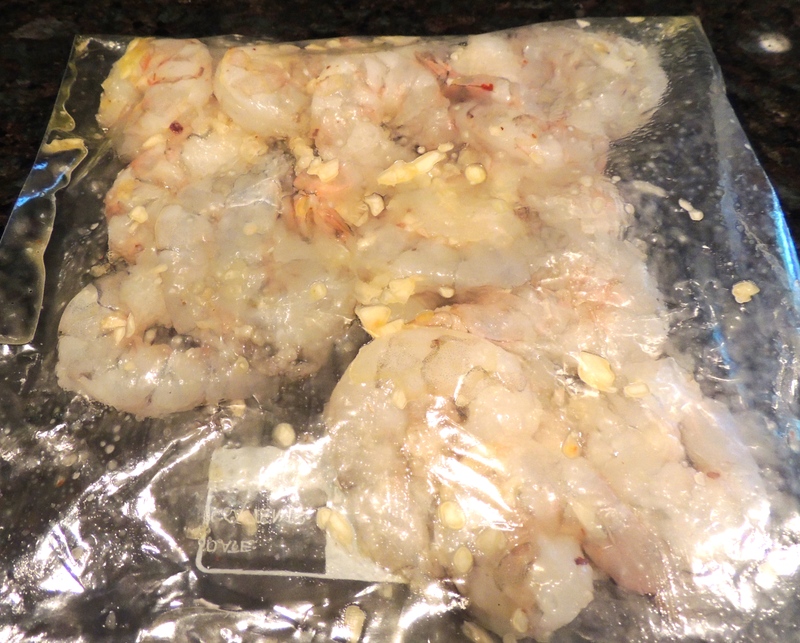 Wrap tightly and store for only a month. Bake at 450 for 20 minutes, then lower the heat to 350 and bake another hour or until the apples tender when pierced with a knife. 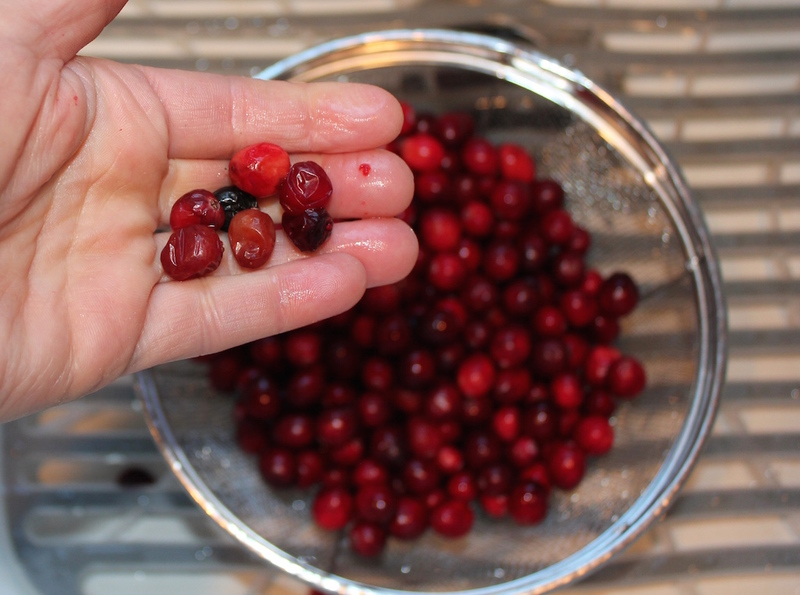 Here’s a quick primer on how to clean berries; a necessary task. It always frustrates me when I read an article or hear someone say it’s not important to clean berries because they’re too delicate. I’ve even read that raspberry skins are so thin they let water in, ruining the fruit. I wonder what happens when it rains? We were at a restaurant many years ago, a very well known and well regarded place. 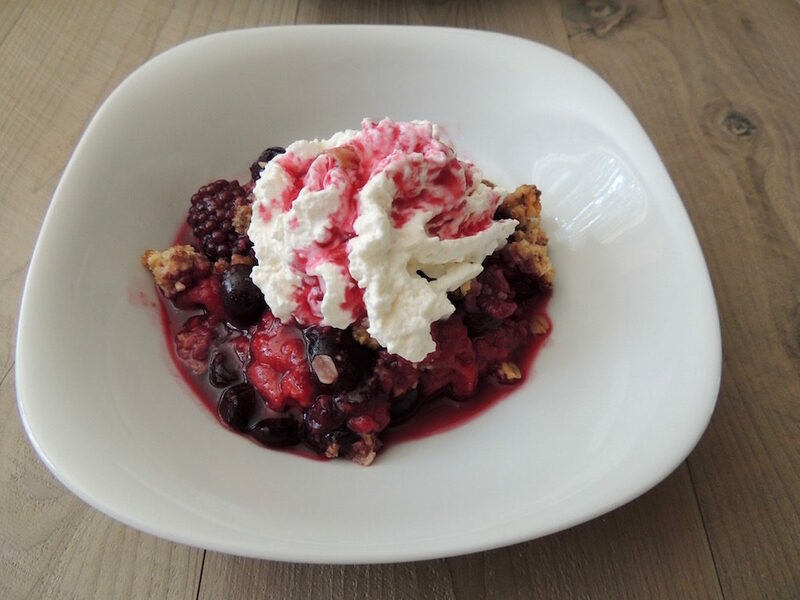 When I went to the dessert table, the bowl of raspberries looked like it was moving. The berries were covered with tiny bugs. Yuk! 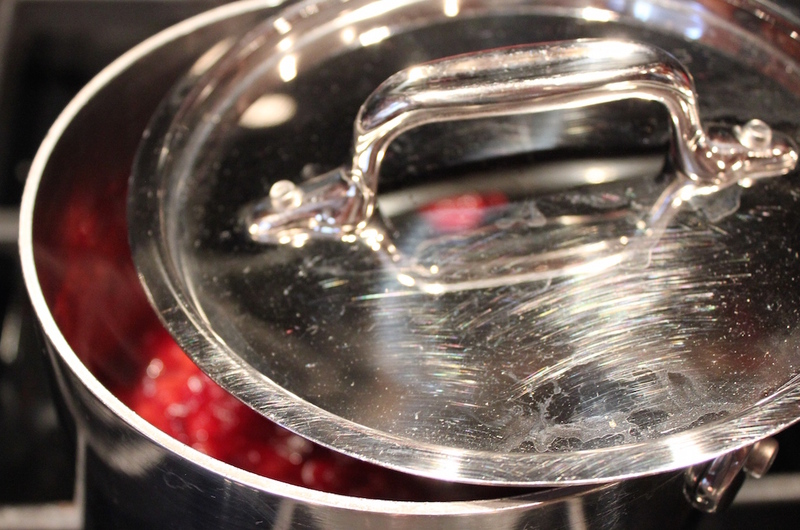 It’s a simple task to clean delicate berries. Fill a large bowl with cold water, gently dump the berries in, swish around and scoop them out with your hands into a colander. Drain and use. It’s that simple! 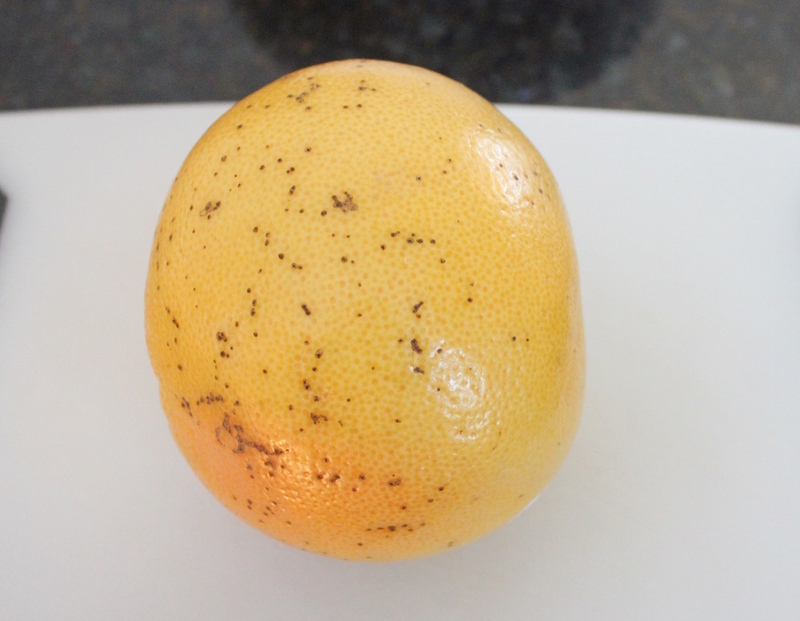 My mother uses hydrogen peroxide to clean all her fruits and vegetables, which I’m not a fan of. There are websites that recommend a combination of vinegar and 3% hydrogen peroxide to remove pesticides. I’ve checked the FDA, CDC and www.foodsafety.gov websites and can’t find any recommendations other than using cold water to wash fruit. 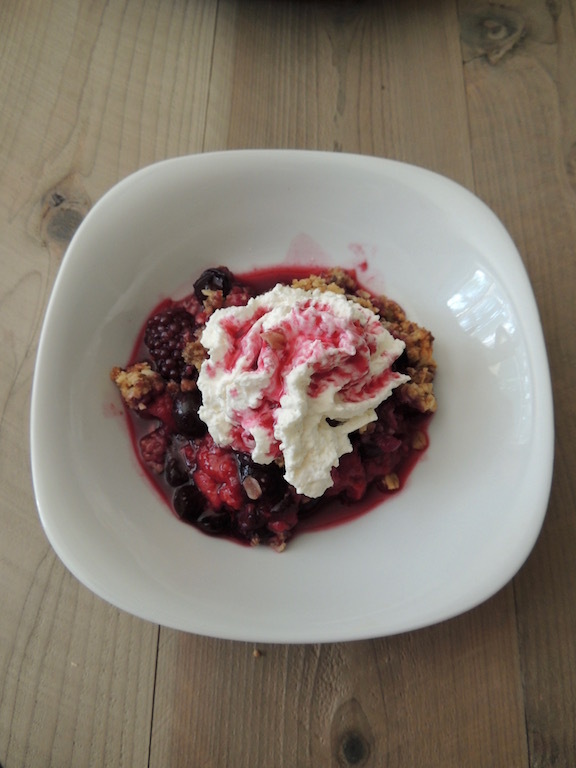 Here’s a recipe for Triple Berry Crisp. 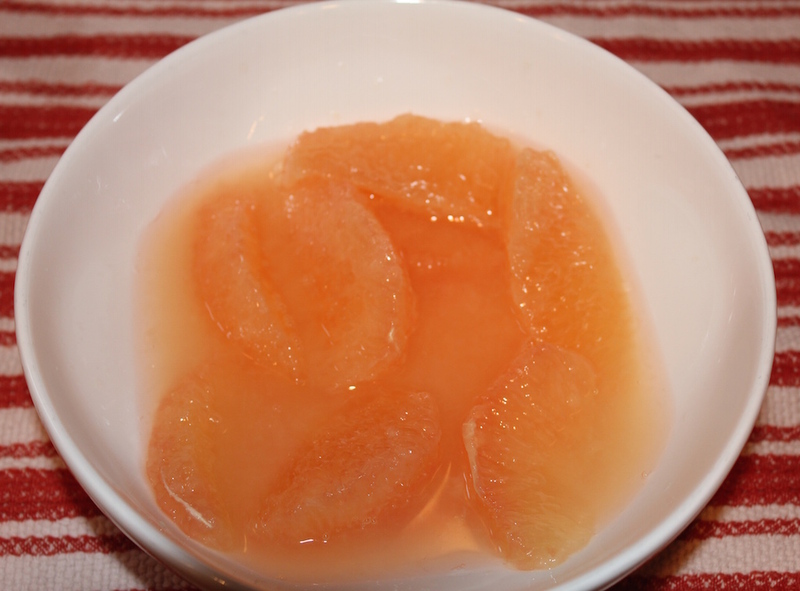 Be sure to read the article on the history of fruit desserts following the recipe. 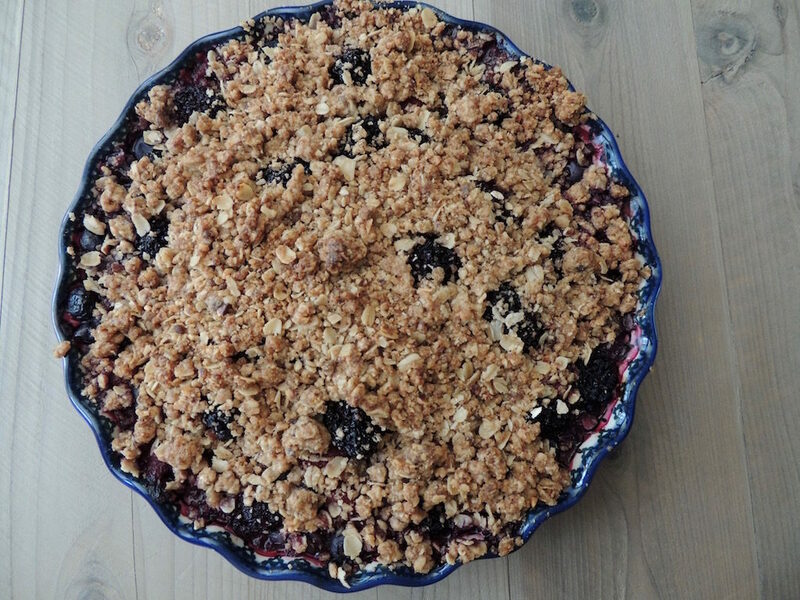 Similar to barbecue, these fruit desserts have staunch followers and specific fruit and cake-type fillings. 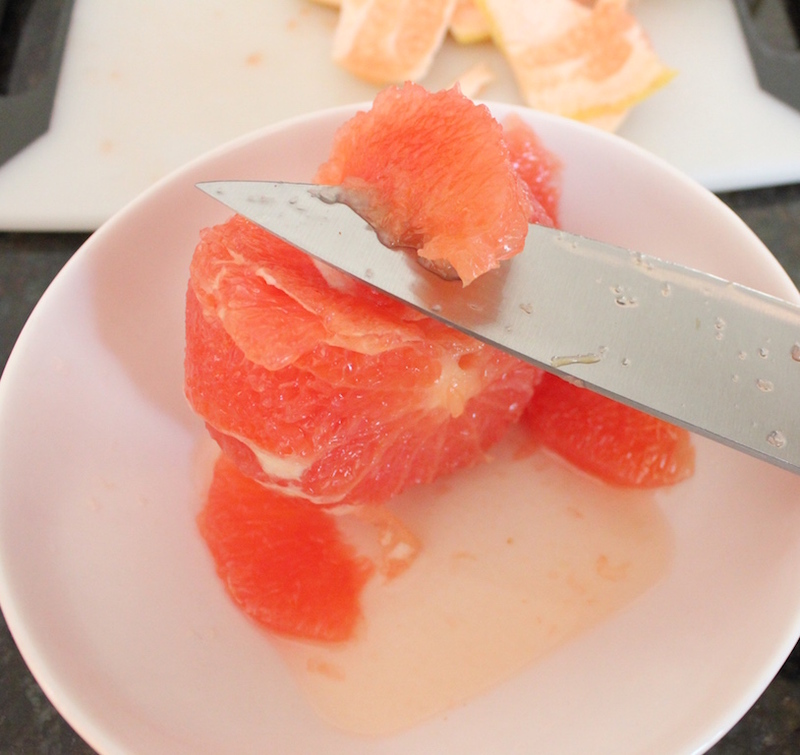 too much of the grapefruit goes to waste when you halve it and use a knife or grapefruit spoon to free the segments . 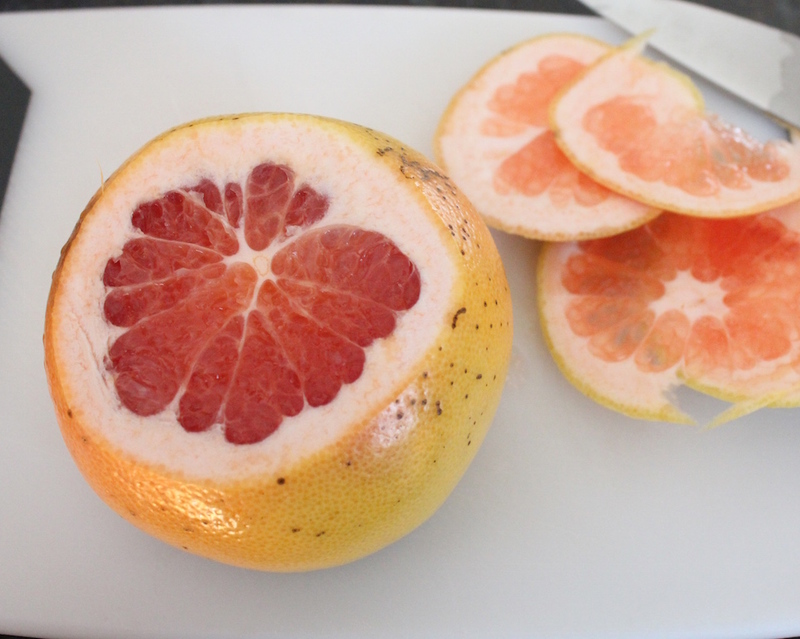 That’s why I love citrus supremes. 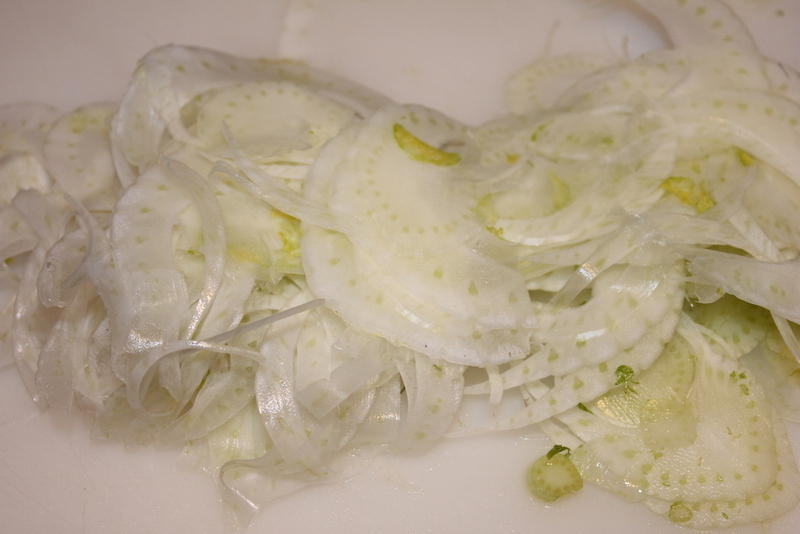 These glistening little jewels perk up any salad. Macerate the slices in a liqueur for a couple of hours for a delightful and refreshing dessert. Or just let them fall into a bowl and devour them! 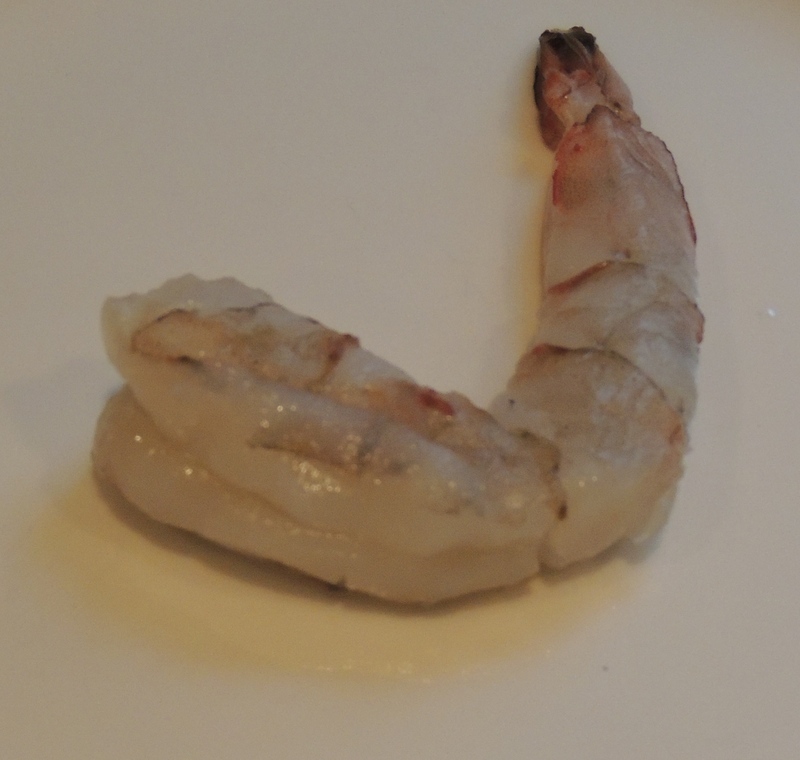 Slice off one end to expose the flesh. Slice off the other end. 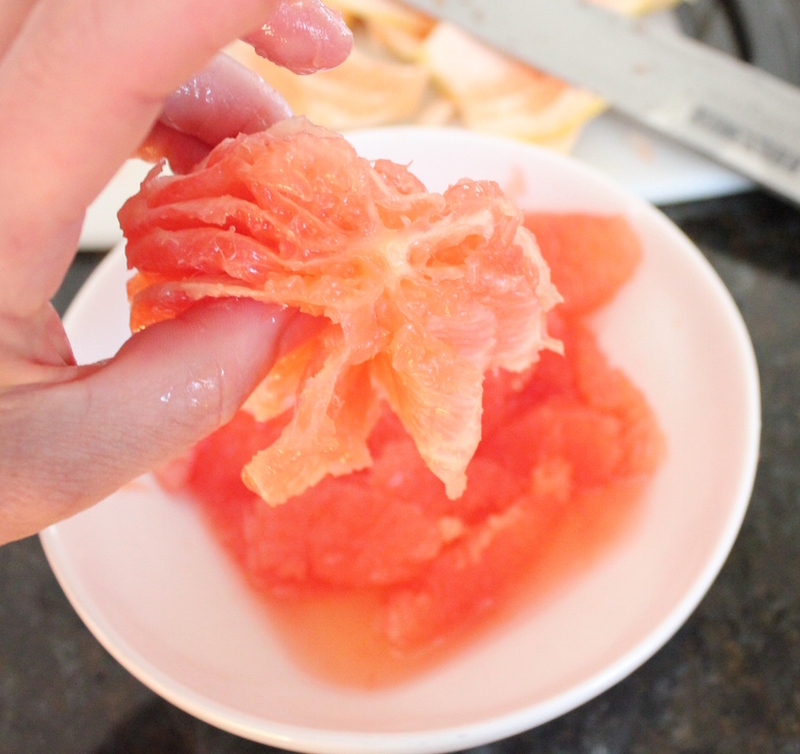 Stand the fruit on one of the flat ends and slide the knife down the sides, top to bottom, to remove the peel and pith. 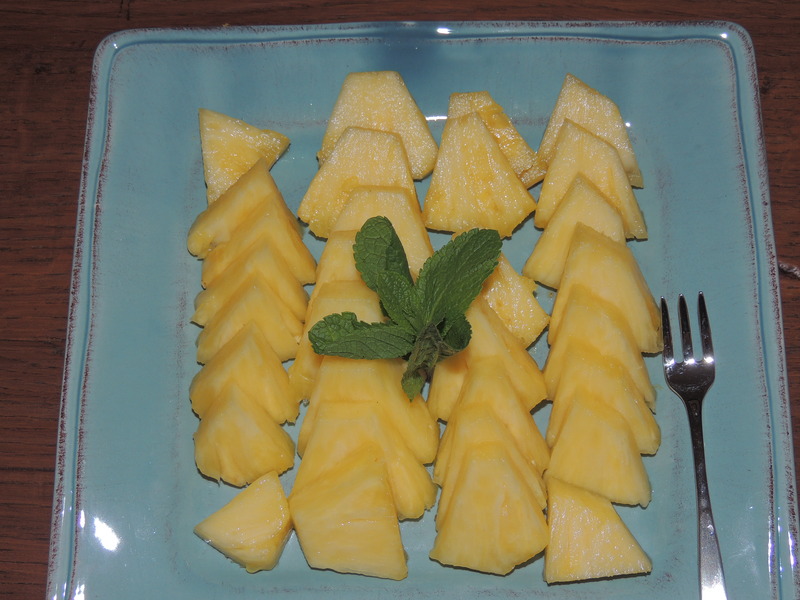 Continue all the way around the fruit. 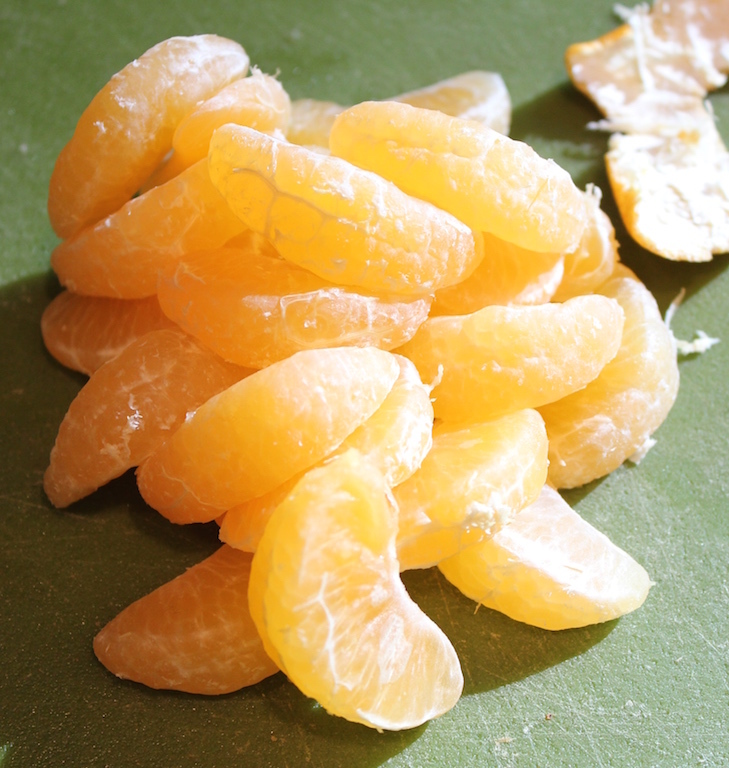 Be sure to get all the pith, and as little of the fruit as possible. 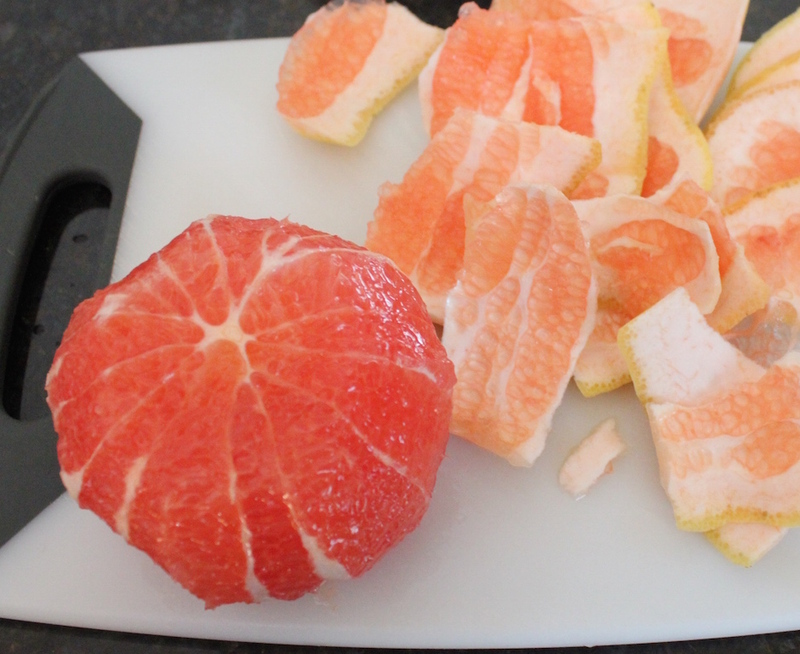 Trim any remaining pith. 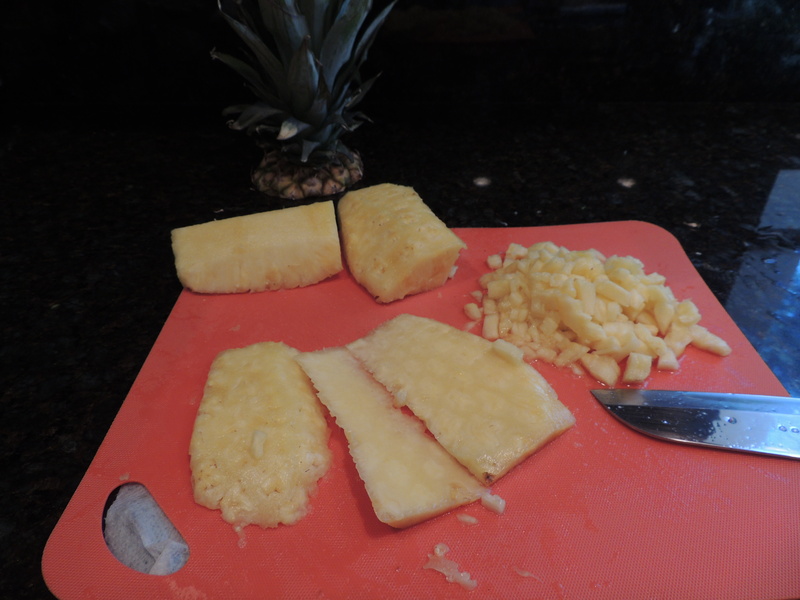 Hold the fruit in your hand, over a bowl to capture the flowing juices, and slide the blade down the side of the segment separating it from it’s outer skin. 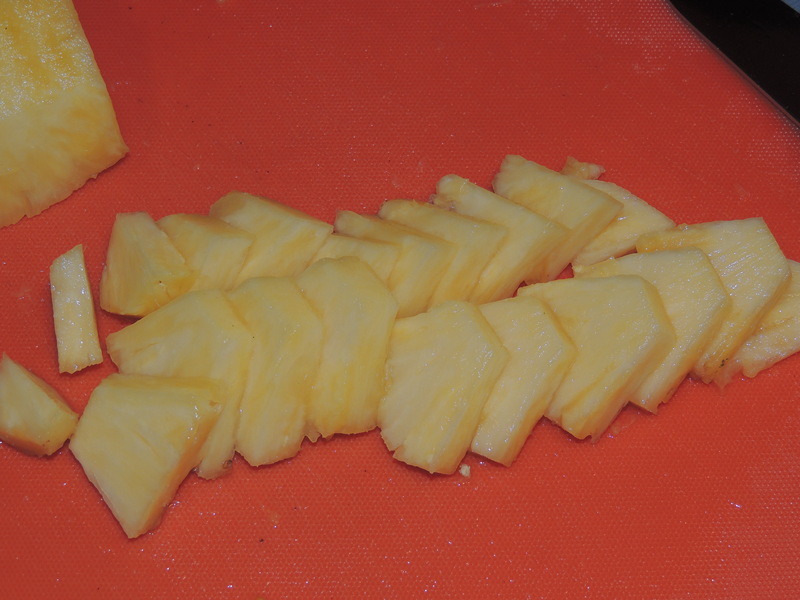 Once you reach the center of the fruit, tilt the knife under the segment and lift it up and off the other side. Squeeze to get all the juice. 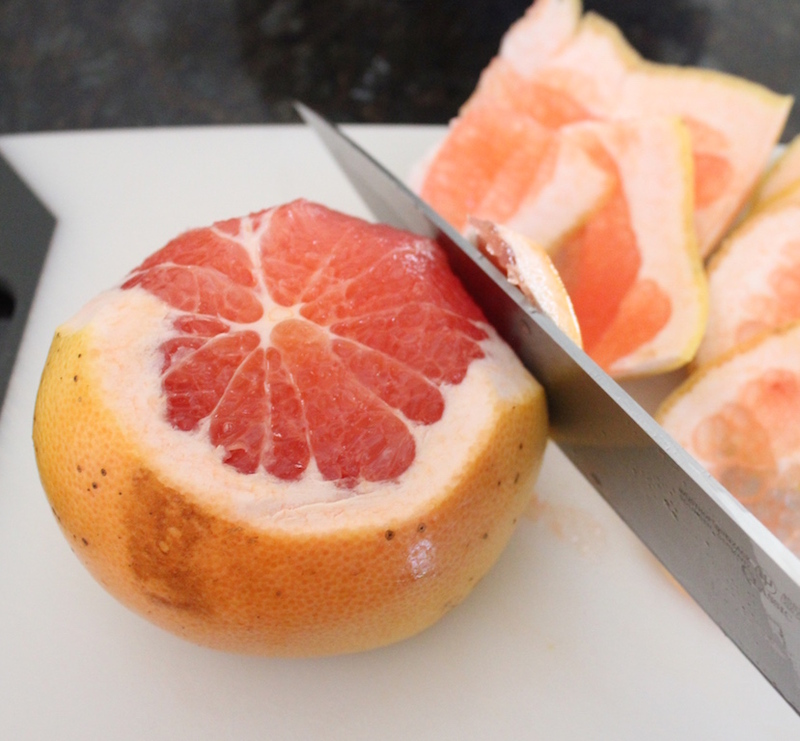 Slice off both ends of the fruit, exposing the flesh. 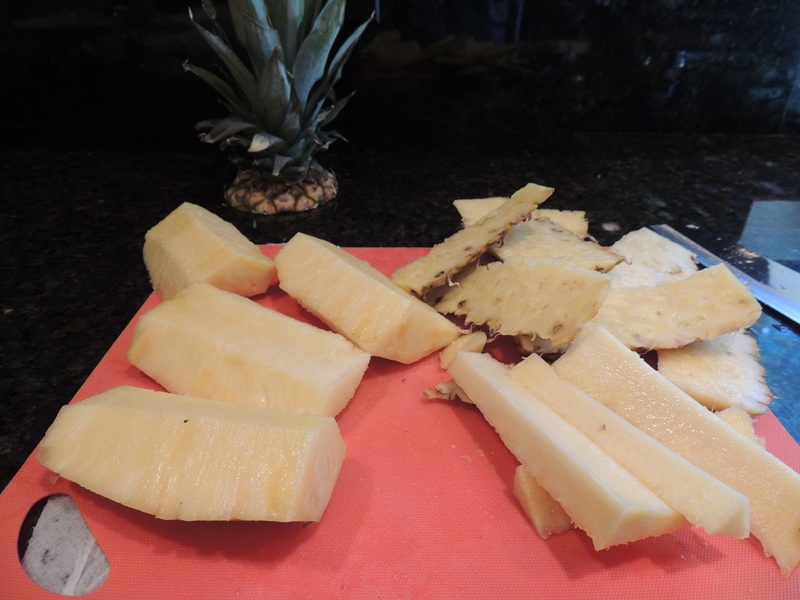 Stand the fruit on one of the flat sides and draw the knife down top to bottom, removing the peel and pith. 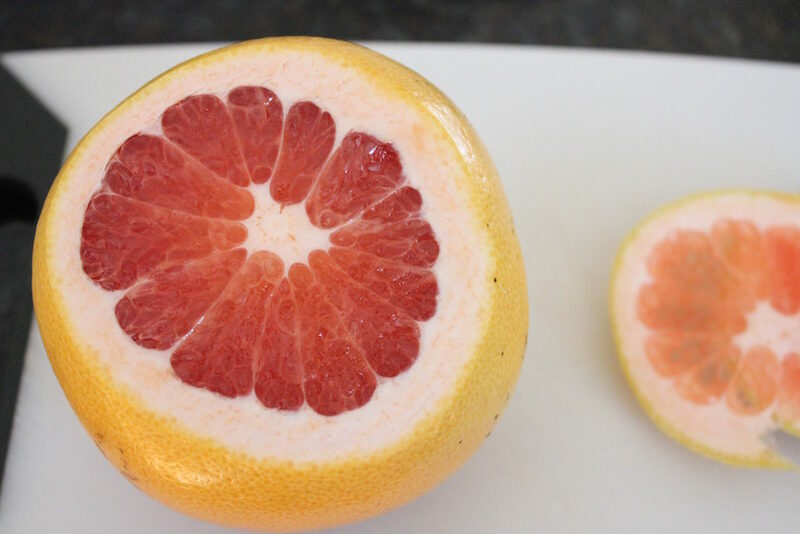 Continue all the way around the grapefruit. 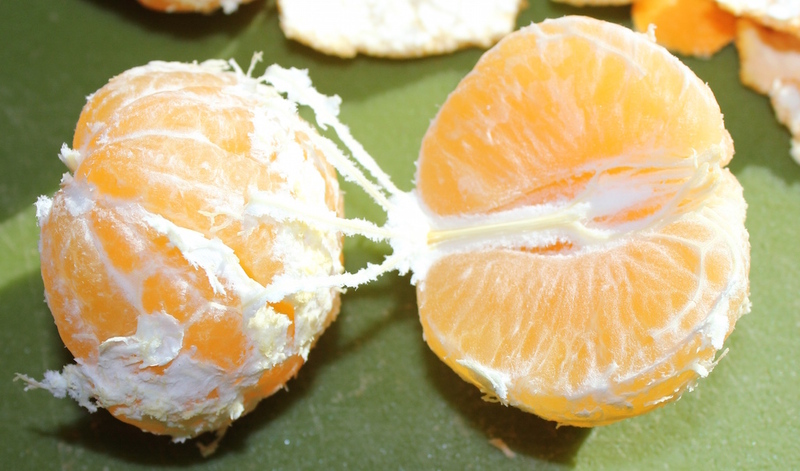 Trim any remaining pith. 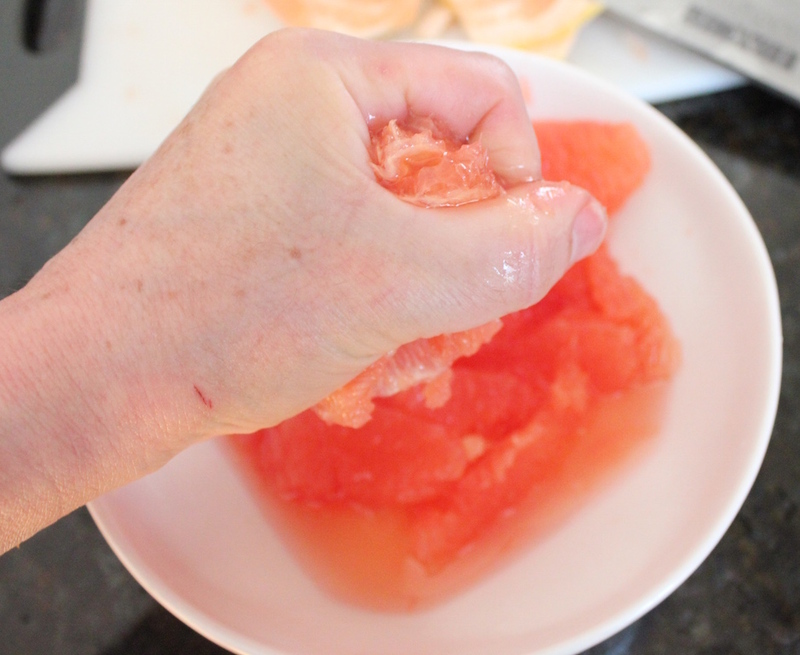 Hold the grapefruit in your hand, over a bowl to catch the flowing juices, and slide the blade down the segment to separate it from the skin. Stop at the center, tilt the knife under the segment and lift off. Continue until all the segments are removed. 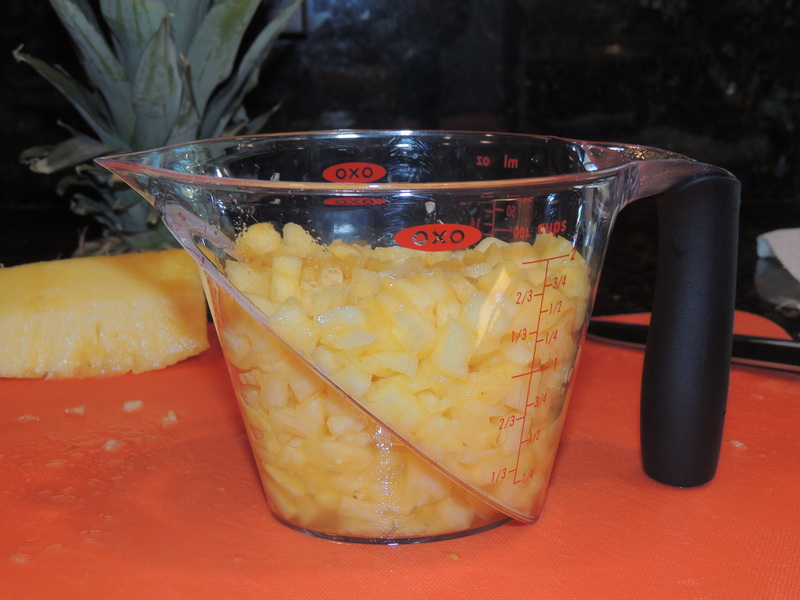 Squeeze the juice into a small container.